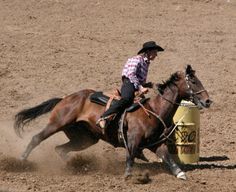 Kelly Dawson Author: B is for ... BARREL RACING! B is for ... BARREL RACING! Thank you for visiting my blog for the #SpankA2Z June Challenge! B was a particularly challenging letter to decide on. There are so many awesome words that start with "B". In the end, I wrote all my ideas down on little bits of paper and put them in a hat and got my kids to pull one out. After much fighting, they managed to pull out just one. Barrel racing! Barrel racing is probably my favourite event in the rodeo. 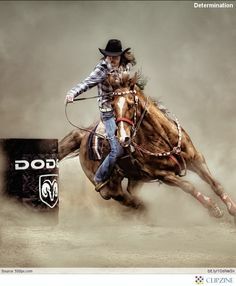 I love the bond between horse and rider, I love watching the cowgirls spin around those barrels in a figure 8 pattern at full gallop, I love the power and agility of the horses. I did it a bit when I was younger, on my farm pony, but we were never good enough to compete, so barrel racing at the rodeo has always been an elusive dream. I tell myself it will happen one day, but I'm not getting any younger, and I don't currently have a horse, so I'll live vicariously through my characters instead. They eyed the course for a few seconds, mentally preparing, tracing the outline of where they needed to run, then Anna spun Flicka around and they were in a full gallop in a single stride. The first barrel loomed closer and closer; Flicka took it at full gallop like a pro. The wind was whooshing in Anna’s ears and the roar of the crowd was deafening – Todd obviously had all his mates cheering for her out there! Before she knew it, the second barrel was upon them and they spun around it at lightning speed, Anna slipping just a fraction at the speed they were turning. Flicka knew what to do. Without even breaking stride, she continued at full gallop down the arena heading for the last barrel, needing no encouragement from Anna. It happened so fast it was a blur - she didn’t even remember taking the last barrel – but they must have, because the next thing she knew she was stretched out over Flicka’s neck, urging the mare on, literally flying down the home stretch. They skidded to a sliding stop to the wild applause of the crowd – Todd’s cheers the loudest – and most appreciated – of all. Enjoyed reading this Kelly, I'm not familiar with this so I learnt something too :) I enjoyed the excerpt, wonderful imagery. Thanks Roz :) Random House NZ has requested the full manuscript for this book after I sent in a proposal a couple of months ago, so please keep your fingers crossed for me that they accept it! It's great when you can "write what you know." It adds such realism. I love how you picked your B topic.